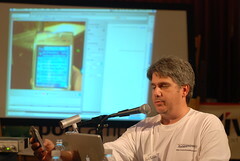 This is the rig I created for demoing mobile applications in action at Podcamp west. I hold the phone up to the iSight camera, the crowd sees it on the projector. Seemed to work quite well.